1. Measure the soy milk into a glass measuring cup or bowl and add the flax, vinegar, oil and agave nectar, stirring well. Set aside while you measure the dry ingredients, or for at least 2 minutes. 2. In a large bowl, sift the flour, protein powder, baking powder, baking soda and salt. Pour the wet ingredients over the dry and mix just to blend (there will still be a few lumps here and there; this is fine). Gently fold in the fruit. 3. Heat a nonstick frypan over medium heat (spray the pan with olive oil spray if desired). Using a large ice-cream scoop or 1/3 cup (80 ml) measuring cup, pour the batter into the pan and spread slightly with the back of the scoop. 5. Serve immediately. Makes 10-12 pancakes. Refrigerate leftovers, tightly wrapped, for up to 3 days. May be frozen (may be defrosted in the toaster). We have been quite lucky this summer (so far) to have great weather for walking. Even last night (when I was thinking it was going to be too hot for an enjoyable walk), the light breeze along the boardwalk made for a fantastic walk. The waves, though, were a bit much for our little dog “jammers” who normally likes to take a few dips in the lake along our route. Whether you are walking on the Board Walk, at Pete’s Dam, around your Block or on a Treadmill, doing a few Yoga Postures before you start and when you finish will round out your walk. This is particularly important for those of you who feel tightness in your hips, back and/or legs when you begin your walk. Yoga gives our body a head start, so to speak. · Scoop them into a bowl and prepare to marvel! 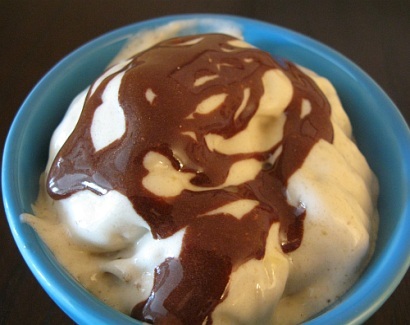 Drizzle it on top of the frozen bananas, and voila! So what are you waiting for? Stop reading, and start freezing those bananas you’ve got sitting on the counter. This weeks recipe is brought to you by a friend of mine who has quite the collection of Recipes! (All tasty and all vegan 🙂 ) Thanks for this Recipe Rose! I just made these and the immediate response from Jeff as he bit into them was “MMMMMMMM”. These easy to make bites are so yummy…you would never guess they are healthy 😉 You could even eat them for breakfast! 1.) Combine oats, chopped almonds, flax, chia seeds, sea salt and cinnamon in a large bowl and stir. 2.) Melt peanut butter and stir in agave syrup and vanilla. Once the mixture has cooled slightly, pour it over the oat mixture and mix well with a spoon. Fold in the chocolate chips. 3.) Roll the mixture into small bite-sized balls and then roll it into the ground almonds, coating all sides. The mixture should look crumbly but easily form and hold a ball shape. 4.) Let chill in the ‘fridge before eating or don’t and eat right away… (what I did!) YUMMMM! Optional add-in’s & substitutions: unsweetened organic shredded coconut, goji berries, raisins, chopped dates, dried cranberries, dried cherries, raw/unsalted sunflower seeds, hemp seeds, walnuts, pecans, cashews, etc. The more things you add in the more peanut butter you will need I think. I was recently at Blue Jays game in Toronto with my husband and each time our favorite player came up to bat or made a sweet play we would cheer just a little louder than we already were. Although I have a special place in my heart for all of the players on the team I seem to have developed a crush on one of the newest members to the team. So when this specific player came up to bat I started hooting and hollering as my husband laughed and said “Why do you like him so much?” To which I answered by giving him a laundry list of his skills and positive attributes adding on the end “And I bet you he does Yoga and Pilates.” This got me curious as to whether he and other professional athletes incorporate Yoga and Pilates into their training. So I looked into it and you would be surprised how many athletes incorporate Yoga and Pilates into their training regime; Lebron James, Ray Lewis, Victor Cruz, Evan Longoria, and Kevin Garnett to name a few. 1. Improve lung capacity and oxygen to the blood. 2. Achieve an overall sense of satisfaction, inside and out. 3. Assist with rehabilitation of injury as well as prevention. 4. Relieve stress and increase athletic focus. 5. Enhance coordination, flexibility and stamina. 6. Learn how the body performs and functions. 7. The practice of postures also develops grace and precision. It teaches the athlete struggle and challenges them without risking injury. 1. Bring quinoa and water to a boil in a saucepan. 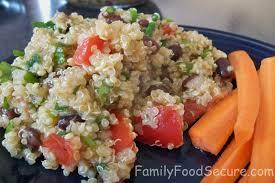 Reduce heat to medium-low, cover, and simmer until quinoa is tender and water has been absorbed, 10 to 15 minutes. Set aside to cool. 2. Whisk olive oil, lime juice, cumin, 1 tsp salt , and red pepper flakes together in a bowl. 3. Combine quinoa, tomatoes, black beans, and green onions together in a bowl. Pour dressing over quinoa mixture; toss to coat. Stir in cilantro; season with salt and black pepper. Serve immediately or chill in refrigerator.